From the makers of Cooties and Stake Land, it's Guardians of the Galaxy star Dave Bautista versus an entire Texas battalion in New York City in Bushwick, released on DVD and Blu-ray 23rd October 2017 from Kaleidoscope Home Entertainment. 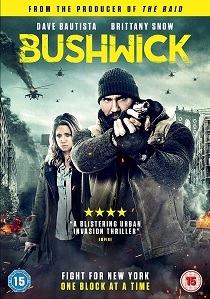 From the makers of Cooties and Stake Land, it's Guardians of the Galaxy star Dave Bautista versus an entire Texas battalion in New York City in the all-out action thriller Bushwick, released on DVD and Blu-ray 23rd October 2017 from Kaleidoscope Home Entertainment. Lucy emerges from a Brooklyn subway to find that her neighbourhood is under attack by black-clad military soldiers. She crosses paths with an ex-Marine corpsman, Stupe, who reluctantly helps her fight for survival through a civil war, as Texas attempts to secede from the United States of America. Action movie stars don't come much bigger than Dave Bautista, Drax from the smash hit Guardians of the Galaxy series, and the villainous Hinx from the latest James Bond film Spectre. Here, front and centre as Stupe, a take no prisoners ex-Marine on the warpath against a Texas militia invading New York, Bushwick establishes Bautista - soon to be seen in Blade Runner 2049 - as an action hero on a par with Vin Diesel and The Rock. Brittany Snow, from the Pitch Perfect movies, excels as Lucy, who, out of sheer necessity when her neighbourhood is suddenly transformed into a dangerous war zone, transforms into a fierce fighting machine alongside Stupe. Brilliantly directed by Cary Murnion and Jonathan Milott, the team behind the cult horror hit Cooties, here deploying some superbly realised action set pieces and imbuing proceedings with a paranoid, anarchic feel; and expertly scripted by Nick Damici - the red-hot writer of the similarly themed apocalyptic thrillers Stake Land 1 and 2, Texas noir classic Cold In July, and hit series Hap and Leonard - the film is, terrifyingly, inspired by real events. Bushwick is a timely, chilling look at the landscape of America right now, as well as a full-bore urban actioner that mixes elements of The Warriors and Escape From New York. 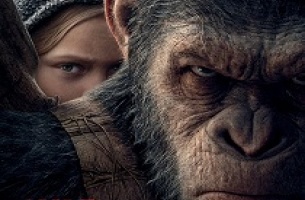 It hits the ground running with an extraordinary opening sequence, and doesn't let up until the end credits roll.